Does this answer your question brother? I think those ol’ boys in Nevada and its surrounding states (read: Utah) know just exactly what to do. Shall we ask our friend what he thinks? ha Ha HA! 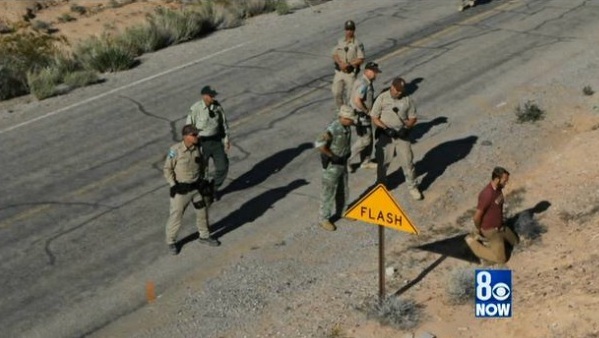 Standoff between armed Feds and armed American citizens. I believe we have just witnessed the second shot heard around the world. Toss in the Obozo factor and we’ll be seeing a lot more situations like this. The Feds need to stand down before we’re forced to put them down! The station reported the following statement, made by Neil Kornze, director of the BLM: “As we have said from the beginning of the gather to remove illegal cattle from federal land consistent with court orders, a safe and peaceful operation is our No. 1 priority. After one week, we have made progress in enforcing two recent court orders to remove the trespass cattle from public lands that belong to all Americans. “Based on information about conditions on the ground, and in consultation with law enforcement,” Kornze continued, “we have made a decision to conclude the cattle gather because of our serious concern about the safety of employees and members of the public. While the Obama administration has not quite been known for its respect to freedom of religion, their latest action is borderline insanity: due to the government shutdown, priests contracted by the military are forbidden from celebrating Mass—even if they want to do it for free. “But now there’s a story just coming to light that takes things even further. According the Archdiocese for Military Services, GS and contract priests (who are paid by the federal government as independent contractors in places where there aren’t enough active-duty priests to meet the needs of Catholics in military service) are being forbidden from celebrating Mass, even on a volunteer basis. Approximately one quarter of the military is Catholic, but only eight percent of military chaplains are Catholic priests. This is just absolutely crazy. If priests would like to say Mass for free, they should be able to. To prevent them from doing so is a violation of the First Amendment. The government is clearly using the shutdown to inflict as much pain as possible, even when it is completely unnecessary.